I read this book in one sitting. This is not something I say or write often – in fact, I can’t remember the time I genuinely sat down with a book and didn’t get up again until I had finished it. This is testament to the quality of this book – although to be fair, I was on holiday at the time and had a whole day to spend by the pool. Even so, it takes a lot for book to hold me so firmly that I lose my sense of time and place; this book did that. The storyline is not easy – in fact, the main character Shelby is so infuriatingly self-destructive that at times I wanted to slap her. Granted, she is almost fatally damaged by the seminal event at the start of the story (a car crash which left her best friend Helene in a permanent coma, but from which she escaped with only minor injuries) – the guilt and horror destroy many years of her life, leaving her broken and only gradually able to emerge from her protective burrow (her parents’ basement). The narrative describes her gradual process of re-engagement with the world and the friendships and relationships she forges (and destroys). This is a study of guilt, mental health and recovery, love and friendship, but not of redemption – although Shelby does rescue a succession of ill and maltreated dogs, there is never any sense that she is trying to redeem herself. In fact, the sense is that redemption could only come if a miracle happens and Helene somehow rises from her bed in her parents’ house where she has lain for eight years. Against hope Shelby imagines this happening when she eventually visits Helene and holds her hand, in an echo of the healing miracles which Helene herself is alleged to perform. In fact, the most powerful sections of the book deal with Shelby’s relationship with her mother Sue, who is tireless and fierce in her defence and care of her broken daughter. Hoffman writes this relationship from Shelby’s perception of it, and these were some of the points where I wanted to shake Shelby and point out her mother’s unflinching and clear-eyed love for her, even when she herself was doing her best to destroy it. This book is not perfect – I have some issues with it, largely the overpowering Christian imagery and the unlikely coincidence whereby Shelby finally meets the ‘angel’ who has watched over her since the accident. Nevertheless it is a moving read, well written and infused with Hoffman’s absorbing and sometimes dreamlike prose style. Highly recommended. I am grateful to NetGalley and Simon & Schuster for providing an ARC in return for an unbiased review. Faithful is published on 1 November 2016. 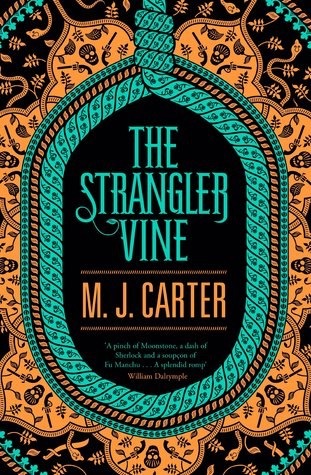 Really enjoyed this – the level of research about India in the early 19thC was evident in the rich detail, and the precarious relationship between the main characters, although a little formulaic in the early sections of the book, developed nicely. The story itself is somewhere between Sherlock Holmes and Indiana Jones, with plenty of intrigue, jewels and flashing swords. Recommended. Book swaps – my new thing? I’ve never done an online book swap before. I have done other online exchanges, but they were quilting/fabric related, back when I was doing a lot of sewing; I haven’t had the time for much of that for a number of years (I miss it…), so no swaps or exchanges either. I’ve never really been pricked to sign up for book swaps; I have participated in a number of reading challenges, but usually come to resent reading stuff because I have to, or to make up numbers, or whatever. I’m also quite bad at deadlines aside from work, which doesn’t help. So I don’t really know how/why I came across Bex and Hanna‘s Ninja Book Swap, or why I signed up. But I did, and I’m so glad. 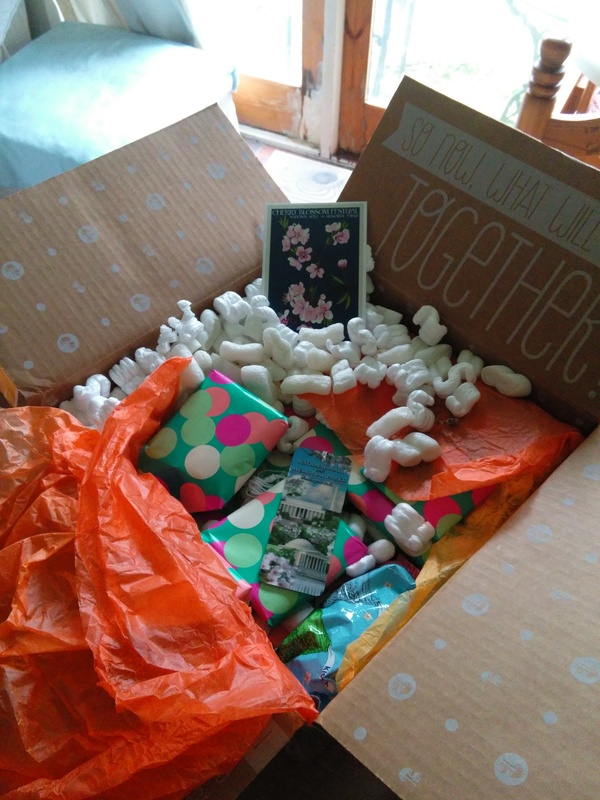 Then, after a short wait, my own parcel arrived today, from Sprite – and what a corker it was! 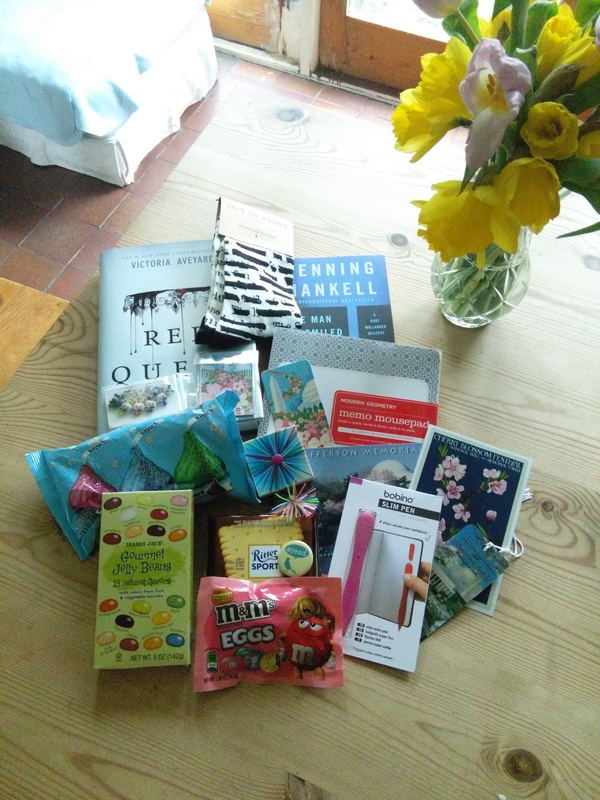 So much joy, such a lovely thing (pile of things) to receive – I think this may become my new hobby. Thank you so much, Sprite – I’ll be in touch personally very soon. And as an extra note – my two daughters were so impressed and delighted with my swap goodies that they both want to sign up for the Ninja Book Swap next time it runs. Spreading the joy! I think it’s more that when I’ve read a book it’s gone, and I want to move on to the next one, and if I’ve taken on a duty to review a book it hangs around and becomes a bit like the friend you invited over for coffee, and who you enjoyed seeing but now they’re still sitting in your living room chatting about nothing, and they won’t leave, and you’ve got somewhere else to be but they WON’T GO, dammit. Also, the title of this post might be slightly incorrect – I haven’t quite loved all the books I’ve listed below, but they have affected me in different ways. So in lieu of reviews, here’s a list of stuff I’ve read recently. Not reviews, honestly. The Shetland series by Ann Cleeves. I’m a little in love with Jimmy Perez, but the one in the books, not the one in the tv series. Just finished Raven Black and White Nights, got Red Bones on order; the prose is clean and spare, the islands are as much a part of the narrative as any of the characters, and I want to go there. The Life-Changing Magic of Tidying by Marie Kondo. Bonkers, and I’m not sure in a good way, but I’ve tidied some drawers in my kitchen. So there’s a start. Successful Self-Publishing by Joanna Penn. A useful basic introduction to the business of publishing one’s own words, by way of preparation for a possible venture I might or might not be considering – some way to go, and people to consult, and stuff to learn, but watch this space. Maybe. The Bone Clocks by David Mitchell. 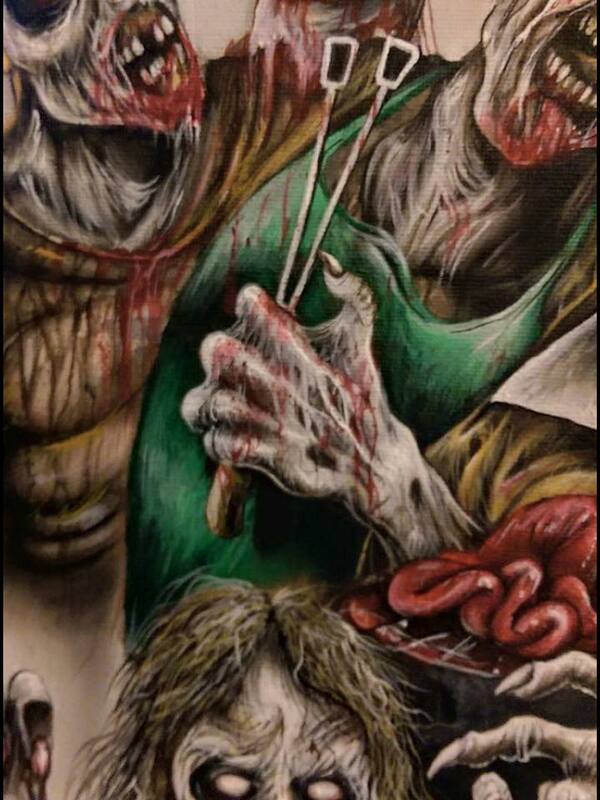 Didn’t want this one to finish – I genuinely did love it. Read it. Perfume by Patrick Suskind. A little late to this party, but I also loved this, although it was deeply unsettling. Perhaps because. I’ll do this again when I’ve read some more stuff. In the meantime, re item 3 on the list, if you can offer any thoughts or experiences of self-publishing, do get in touch. I have some ideas. Belated shout out – this is happening this evening. I’m going, should be interesting – and there might even be a few of my dialect books on display! 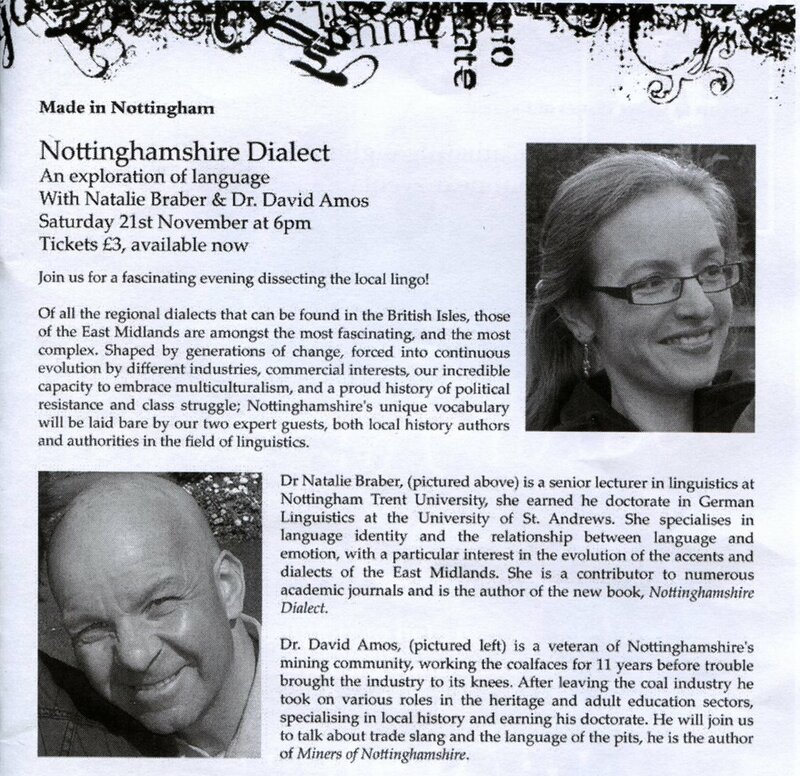 A Nottinghamshire dialect even organised by Bradwell Books, with local experts in attendance (not me), in Waterstones Nottingham, 6pm, £3 entry – come along if you’re in the area, see you there.